Dependency ratios are a term to know and understand. As investors and individuals, dependency ratios practically define our financial futures. You can calculate the dependency ratio by dividing the number of dependent people younger than 18, and older than 65 by those between the “working ages” of 18-65 years old. This calculation essentially provides for an economic stress test – how many people are pure consumers relative to the number of pure producers. World War II was not, in any way, limited to the United States. That is hardly a revolutionary thought, but many of us like to discuss post-war baby booms as if such occurrences are exclusive to the United States. In fact, it turns out that every country involved in WWII saw a boom in baby-making in the years that followed. I included Spain in the above chart, mostly because it makes a good case for the role of dependency in looming debt concerns. Already facing high debt loads, it has one of the highest dependency ratios in the world, a real burden. But what is most interesting here is how all developed nations seem to be on the same “wavelength” as far as dependency ratios over time. A global baby boom kicked off from the end of World War II made it so that every nation involved heavily in warfare fell in sync with one another. What is important here is the magnitude of declines in dependency ratios. 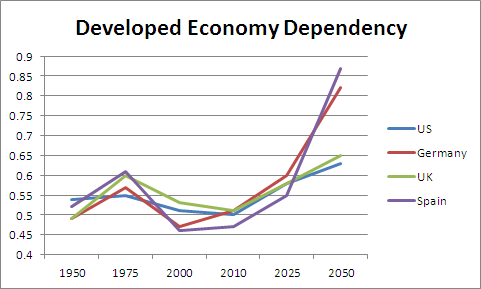 From 1975 to 2010, dependency in Brazil, India, and China fell as much as 50%. China is a particularly interesting case, as the one-child per family policy ultimately results in a much faster growing dependency ratio in the future. Given that families in the most heavily populated areas can have only one child, it is only natural to assume that China faces a horrible dependency ratio as parents grow older, and a single child is left to work from the passing generation. For now, nothing seems capable of slowing down any of these three economies. Even without heavy data-mining, we can see very quickly how dependency ratios affect economic growth. The developed world faces rapidly rising dependency ratios. 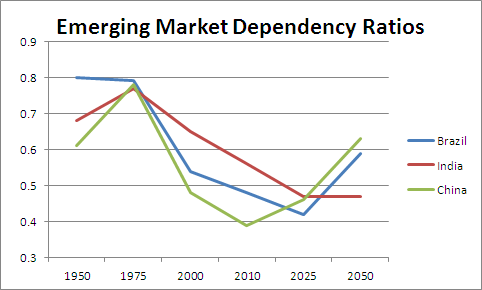 The emerging markets, with the exception of China, won’t see an increase in dependency until the period 2025-2050, at least 13 years from today. Dependency ratios greatly influence the movement of capital within an economy. Developed world economies, free to spend like careless young people from the 1950s to the 2000s will soon be burdened with higher social costs. Additionally, workers will naturally trend to the services, especially health care services, as more people consume more medical care. Emerging markets recently freed from dependency find domestic consumption as adequate fuel for economic growth. It seems fairly evident that the best days for broader economic growth are over for the developed world. Emerging markets seem to have plenty of growth remaining, given that national income can be allocated more heavily to investment and production, before a generational gap later leads to heavier consumption. Darwin wrote a post last year about how older Americans will wreck your life. His premise is right on, but it’s any pain from an aging population won’t be felt only in the United States. The entire developed world will soon have to shift more resources to aging populations. As for the emerging markets, it looks as though they will get off scot-free! What about the goal of being dependent on the government as a young person, but not really? For example, try and get as rich as possible by 40, earn good a mount of passive income, and collect government benefits for as long as possible that supplements that passive income? For the purpose of statistics, I don’t think the scenario of getting rich by 40 is really all that common. As far as dependency, it’s mostly irrelevant. Sure, there are people over 65 that are working, and people under 65 that are not, but in the grand scheme of things, the net effect on any macro calculation is pretty much zero. The point is really the shift of resources. Keeping people alive is expensive, both in monetary terms, and in abstract opportunity costs. China’s going to be facing some real headwinds – you touched on it with the data. With the advent of ultrasound, there’s been a rash of female abortions, sending the male to female ratio skyrocketing. This has serious effects a generation later with a country full of males with no suitable mates. This impacts everything from a continually low fertility rate/capita to societal aggression issues (data indicates larger male-oriented groups are more aggressive than balanced groups – surprise). They have a real issue on their hands later this century. Good post, thanks. People tend to have 5-year horizon about all these things — unable to see more than 5 years into the future and tendency to project the past 5 years as what’s to come indefinitely. Right now everyone’s freaking out about China. Before that Japan. Before that Russia. In reality US is quite enviable demographic position for almost any country with steady population growth and open system that attracts most enterprising individuals from across the world. And even if China does become the dominant power by 2050 or 2080, it hardly means anything negative for the US. UK went from world superpower to anything but and yet its GDP, GDP/capita, equity markets, etc all enjoyed nice growth even as its superpower status evaporated. 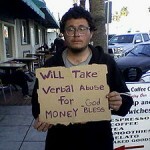 Previous post: It’s Good to be Diversified!